How to use everyday activities to develop your child with cerebral palsy. You should be able to explain this to others in your family or community. A carer is the most important caregiver for a child with cerebral palsy. Think about the time that is spent every day with the child, doing everyday things with her. With all the washing and feeding and dressing and giving medication and other things that you have to do with your child daily, you may already be very busy and feel quite stressed. And you may be caring for other children too. 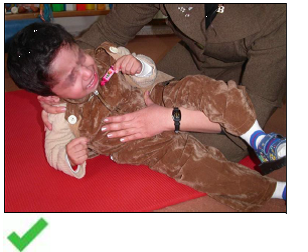 A common thought is when the carer will find the time and energy to do a lot of exercises to help the child develop. All of these daily things need to be done with the child anyway. So if they can do them in such a way that they are stimulating the child at the same time, this will help the child a lot with her development. This story demonstrates how to communicate with a child in an everyday situation. We first discussed this in our session about communication. Look at these pictures again. 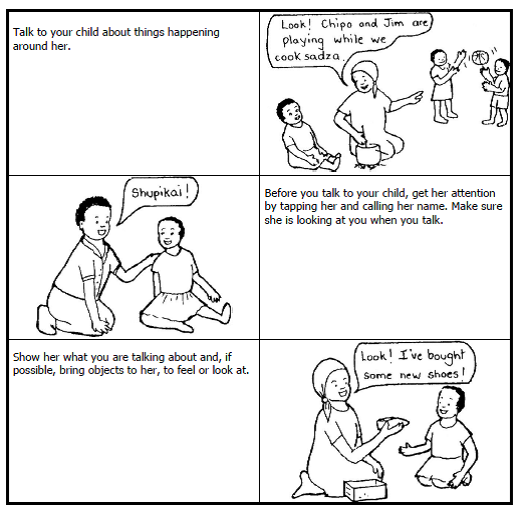 They illustrate some of the things that we discussed about helping a child learn to communicate. 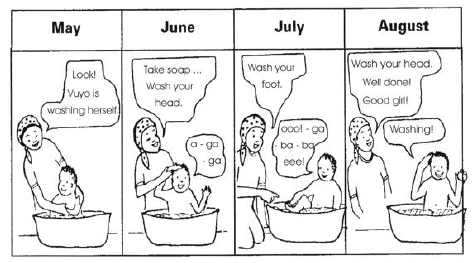 Notice how Vuyo‟s mother in the second bathing picture strip uses these ideas to help her child to learn to communicate. So far, we have concentrated on only one skill – communication. We now need to look at the other parts. to sit by holding her in a helpful position while she moves her arm to reach up to her head. by encouraging her to balance while moving her limbs. 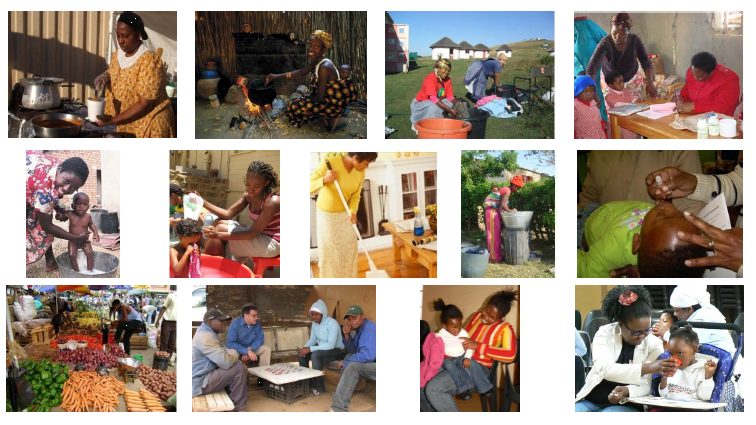 (In the top row, the caregiver always holds on to her child, as she has never become aware, or given the child opportunity, to learn some balancing for herself). The child is learning a self-help skill, bathing. Over the months, this child is learning to bath herself, with just the amount of help and encouragement she needs on each occasion. The child is playing and having fun while learning. The caregiver first performs the activity but involves her by communicating what she is doing - > then she involves the child by helping the child to do it with her - > then she lets the child do more by herself and only points out what is needed -> then makes the request and stands back while the child does it herself. This works especially well for children who move a lot. Notice that the child's feet are supported and in a good position. Notice that the carer‟s other hand is on the child‟s back. Earlier we talked about you needing to do all the daily activities with your child. And that if you can do them in such a way that you are stimulating the child at the same time, then this will help the child a lot with her development. Let's look at some examples of how we can use different everyday situations to help children to develop. Bending forward with your legs straight will cause small injuries to your back every time you do it. Over time you may develop severe back pain. Bend your knees and keep your back straight or even slightly hollow. It is sometimes easier with one foot slightly in front of the other one. Hold the child as closely to your body as possible before lifting. If your child becomes much bigger and heavier, preferably do not lift her alone, but ask someone to help you. Count before lifting so that the two people lifting, do so at the same time. This picture shows a poor carrying position. A more upright position will help her to hold her head up and look around, even if it can only be for short periods at a time. 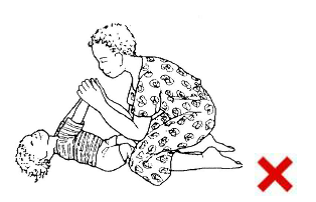 You can also try these positions if your child has uncontrolled movements. And if one side is more stiff than the other, try to stretch that side. But don‟t always carry her only on one side. Sometimes change to the other side. Try carrying your baby in this position on your forearm. It can help her to develop control of her head when lying face down. nd so the development of extension is becoming a problem. Even though the legs are straight, they are separate and relaxed. If the child‟s legs are stiff and crossed, this is not a good position to use. If the child‟s legs are stiff and crossed, this is not a good position to use. Have you tried these traditional positions? Make sure her hips are open, but do not force them. Wrap her arms around you with her thumbs facing up. Each time you carry her, turn her head to the other side. 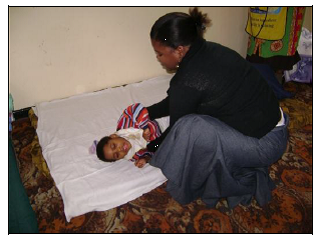 The blanket can provide full muscle support, or if you put it under her arms, she will have to work to keep her head up, and be able to move her arms. 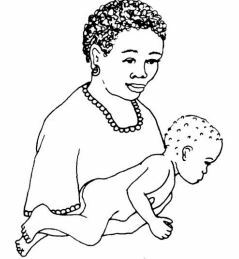 By sitting the child everyday to wash and dress, the caregiver is doing “exercises” with the child that help her develop over time. The child doesn‟t have to sit on your lap as shown; she could sit next to you on the bed or in front of you on a low bench. Make sure that your child is in a comfortable, functional and helpful position. Give some cleaning or kitchen equipment to your child so that she can imitate what you are doing in play. To open legs that scissor or cross when washing or dressing Avoid pulling the legs apart while holding onto the feet, as in this picture. This will make the legs pull together more and may cause the child pain. Ask a therapist to demonstrate the following helpful method, explaining how it could be done for your child specifically. First put something under the head and shoulders to bring them forward a bit. Hold the child's knees and bend the legs up. Bending the hips will help to relax the legs. Hold at the knees and keep the legs apart as you straighten them. It may also help to turn the legs a bit outwards. Avoid pulling the fingers and thumb out by their tips, as in this picture. This will make the hand close more tightly and may cause injury to the fingers! Now it will be easier to open the hand. Handling the thumb at its base, take it away from the hand. Now open the other fingers gently. 3. “Let‟s Communicate – A handbook for people working with children with communication difficulties”, World Health Organisation, Geneva (1997). 5. 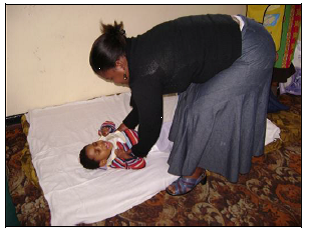 “Cerebral Palsy, ga se boloi (it‟s not witchcraft)”, Physiotherapist Department of Gelukspan Center, Reakgona.